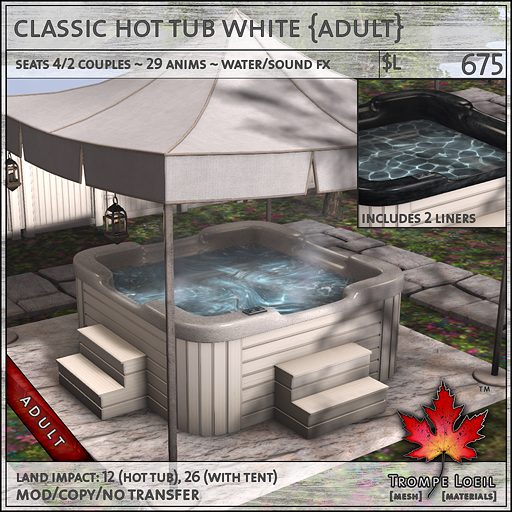 June is a big month for Trompe Loeil releases! 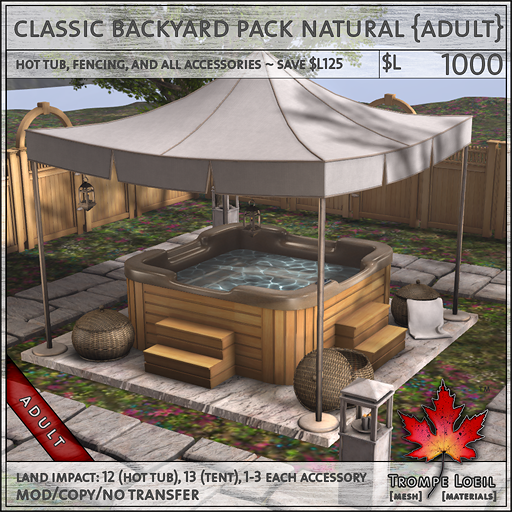 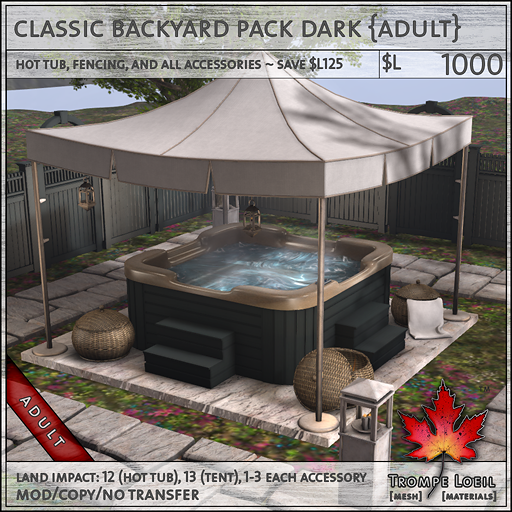 First up at FaMESHed, indulge in the backyard hot tub of your dreams with our new Classic Backyard Hot Tub Collection – three wood options, accessories, and the best-looking water effects you’ve ever seen on a hot tub! 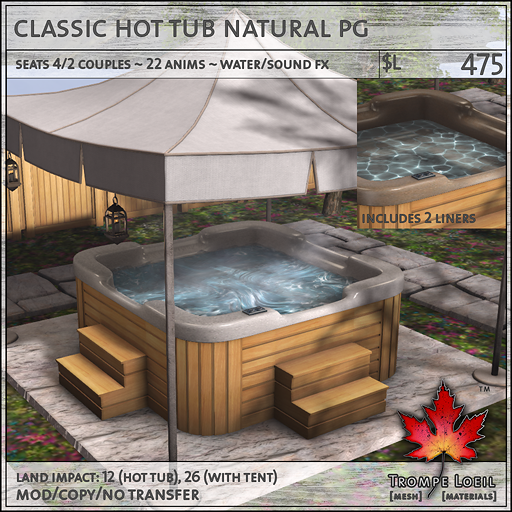 The Classic Hot Tub seats 4 individuals with single animations, and/or 2 couples with couples PG and Adult animations. 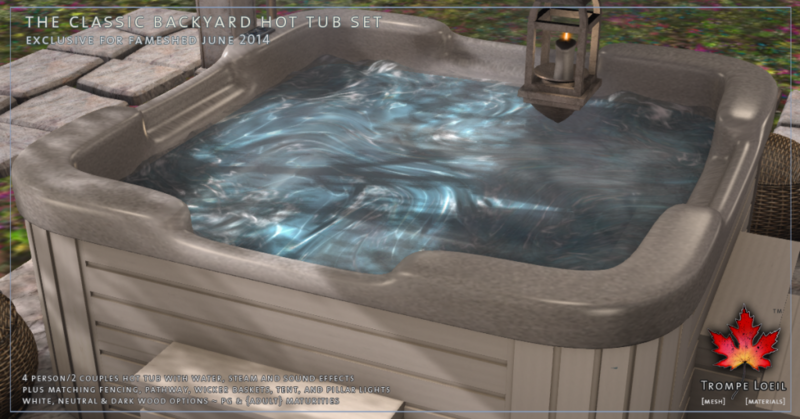 Touch the control panel to access the effects menu – turn the water from a calm caustic reflection to churning, bubbling water in motion, perfect for soaking! 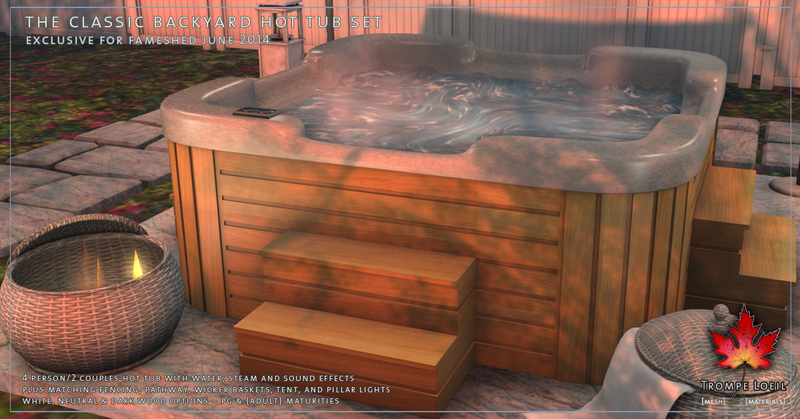 The effects menu also includes particle steam and hot tub sounds for the full realistic experience. Each option is available individually so you can customize your indulgence. 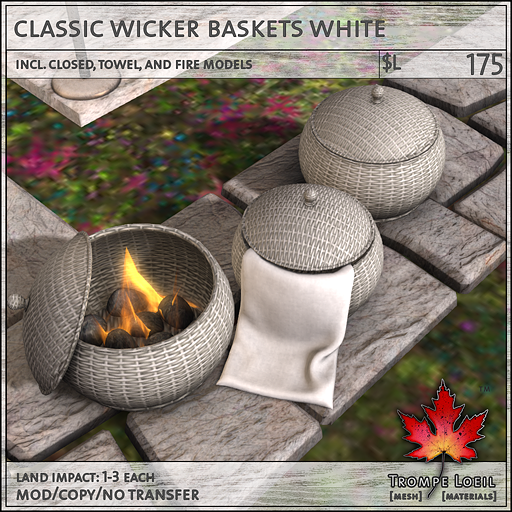 The included tent option features tintable fabric and trim and included hanging candle lanterns for a warm glow on summer evenings. 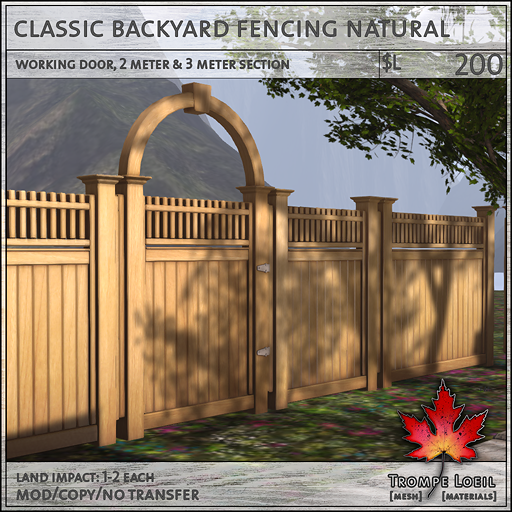 We’ve also included a beautiful fencing kit that matches the three wood finish selections, which features a working door section, a 2 meter section and a 3 meter section for easy deployment around any space – plus an extra 2 meter cobblestone pathway section for defining walkways! 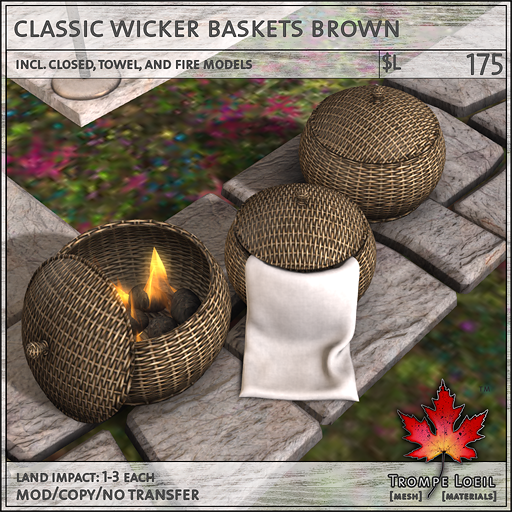 Accessories include a Classic Wicker Basket 3-piece set in brown and white, and Pillar Lights for walkway illumination. 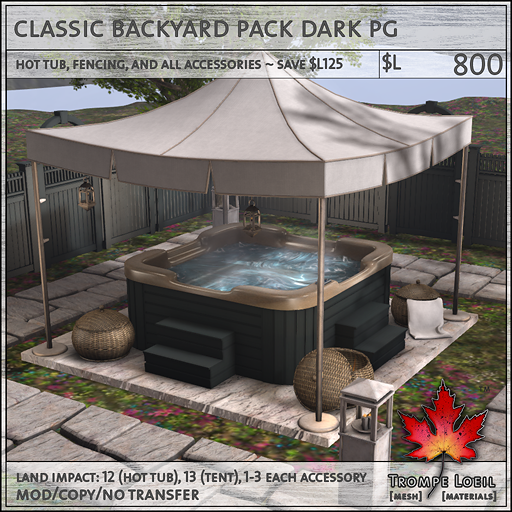 Get just the items you want separately or pick up the Backyard Sets that include everything in your favorite wood finish and save $L125 off the total combined cost! 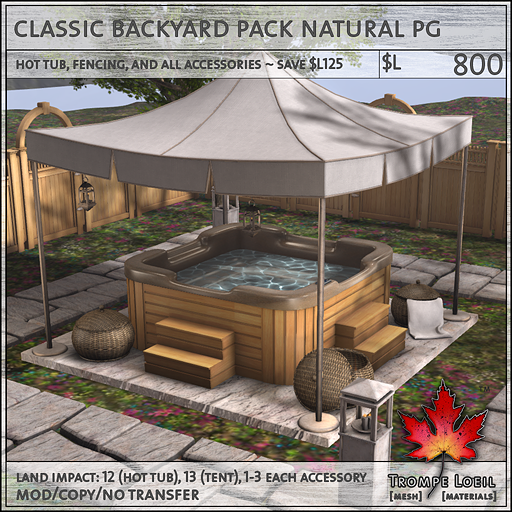 Demo display is up at FaMESHed now – grab some friends and try it out in person! 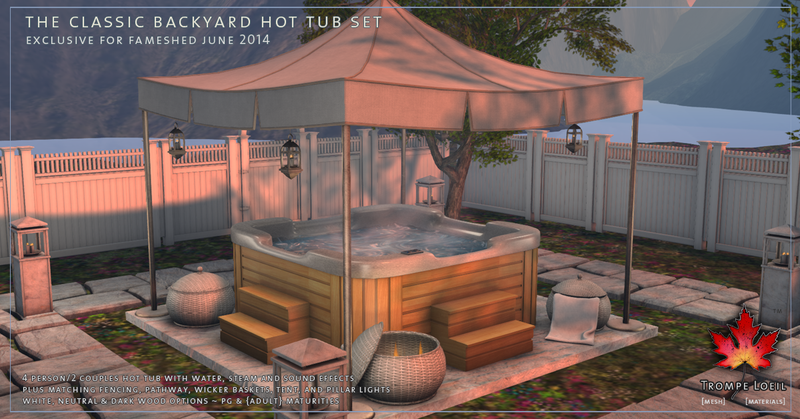 Also new for June – The Arcade is back! 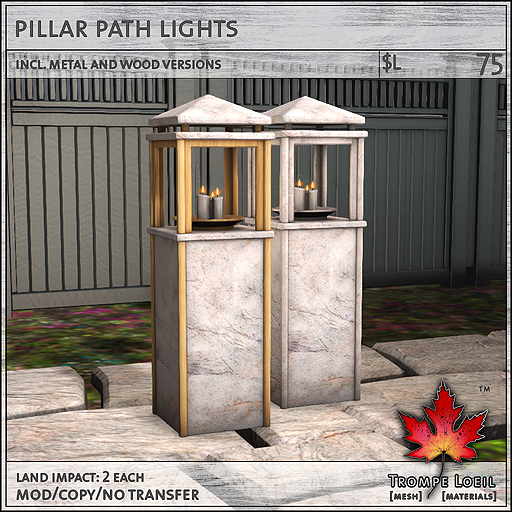 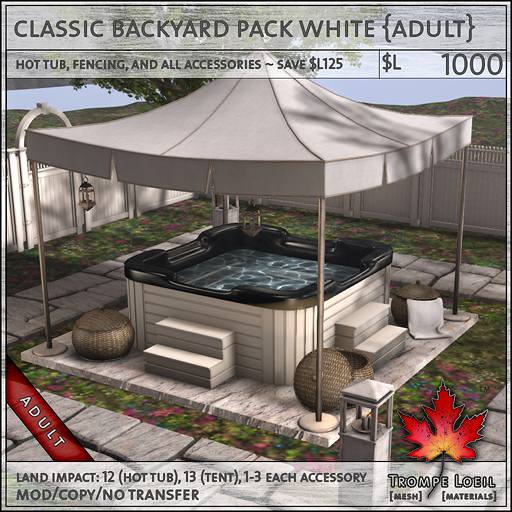 Trompe Loeil’s offering this round? 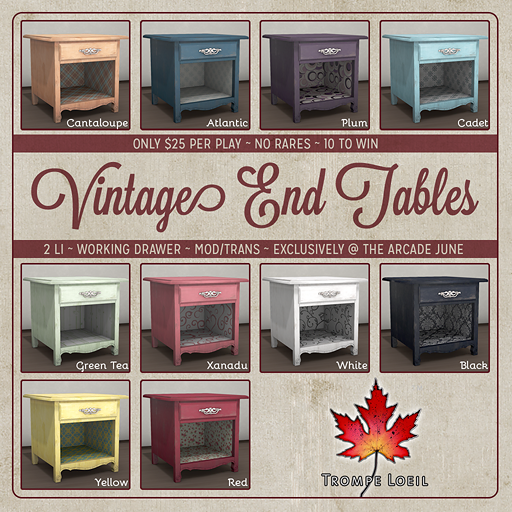 Vintage End Tables in 10 fun colors – no rares, only $L25 per play. 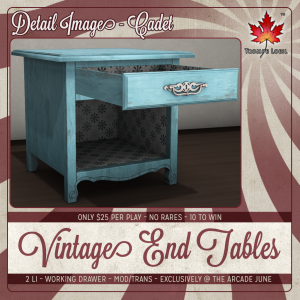 Featuring working drawers, distressed painted wood, and distinctly patterned drawer and shelf interiors for extra interest, these End Tables work in any room of your home. Only at The Arcade for the month of June!